A very rare variety of green Garnet of very bright colour. 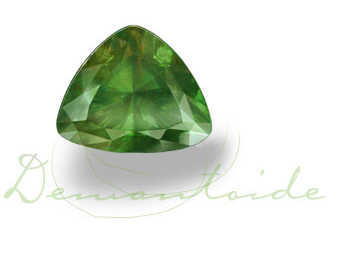 Demantoide means "similar to Diamond" and in fact, Demantoide shows a dispersion (split of colours) like we know from Diamonds. The best and most sought for mines are those in the southern Ural near Jekaterinburg and Asbest. A special feature is the so called pony-tail inclusion, bushels of Bysolite-needles that look like a pony-tail. These inclusions are not value reducing, on the contrary: they are the quality sign for Russian Demantoides. Other mines are in Italy, Namibia and recently in Iran, but their importance is limited.